A couple of hours walking around the zoo is enough to work up an appetite. We had already been at Lincoln Park Zoo for a little over an hour when everyone started asking about lunch. J asked if there was anything we could walk to, but it’s a little bit of a walk through Lincoln Park to get to any restaurants outside the zoo, so we just took advantage of the restaurants inside the zoo to quiet the rumbling stomachs. We made our way back to Park Place Cafe for a potty break and after J took L, she came back out to the patio where her step-dad I were waiting. J said they had a decent looking food court and she was hungry, so we followed her back inside to grab a quick bite to eat before finishing our zoo journey. 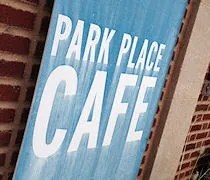 The Park Place Cafe is in the middle of Lincoln Park Zoo which itself is in the middle of Chicago’s Lincoln Park. The zoo is free so this is a place you could stop in for lunch whether you’re wandering around the zoo or not. Heck, if you’re just in the park or at the nearby beach you could wander over for something to eat. 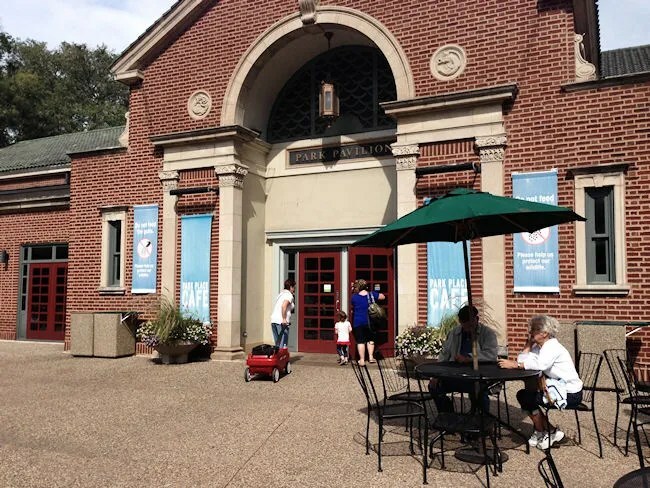 The Park Place Cafe is actually the zoo’s old Reptile House. It’s a large stone building with an open floor plan. One one side is a cafeteria style food court and the other side is the dining room. There are four different counters to get food from plus an ice cream counter and a drink counter that even has beer. We sort of split up once inside. Grandpa took L to find a seat while J and her mom went to the Safari Sandwiches. They got three grilled cheese combos which came with a bag of chips and a 16 oz fountain drink. 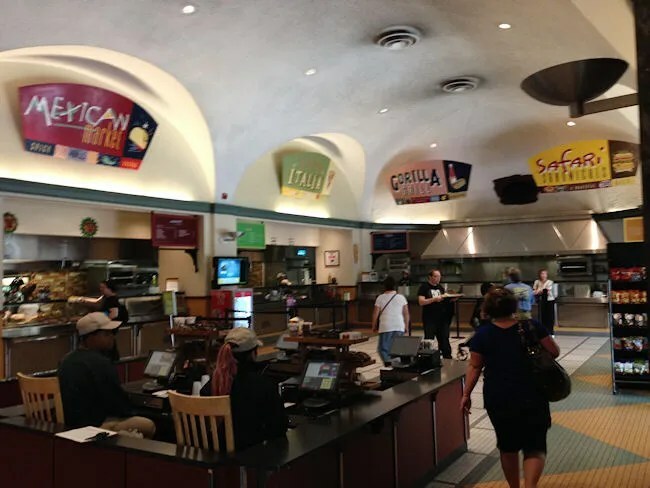 I went to Festa Italia to get an Italian beef for myself and a slice of pepperoni pizza for L.
Once we had meals for everyone, we met at the cash register and rang everything up. The total was just under $40 which, for what we were getting, seems a little high, but you are in the middle of Chicago and in the middle of a zoo. We piled everything on to a tray then went and found L and her Grandpa. The three grilled cheese sandwiches were all pretty plain. They looked like what you would make for yourself at home. A couple slices of American cheese between two slices of buttery white bread. No one had any complaints and with the chips, they made a pretty filling meal. My Italian beef came loaded with hot peppers and I let it sit for a little bit to let the gravy soak in to the bun after getting it dipped. 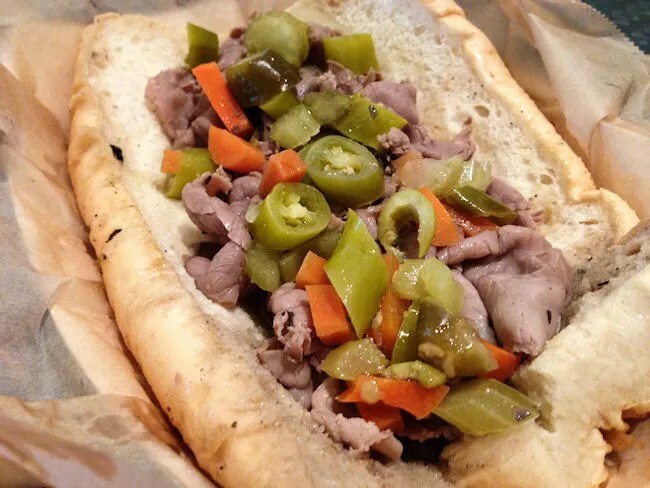 It tasted like the kind of Italian beef you would get outside of Chicago. It’s an Italian beef so it’s still incredibly delicious, but this isn’t the kind of place that is going to roast their own beef. It’s the kind of place that is going to take already sliced beef out of a bag and heat it back up in the provided au jus…at least that’s what it tasted like to me. Again, still good because it’s still an Italian beef. L was probably the big winner here with her slice of pepperoni pizza. The slice comes from Aurelio’s Pizza. This is a Chicago chain that makes Chicago style thin crust pizzas. 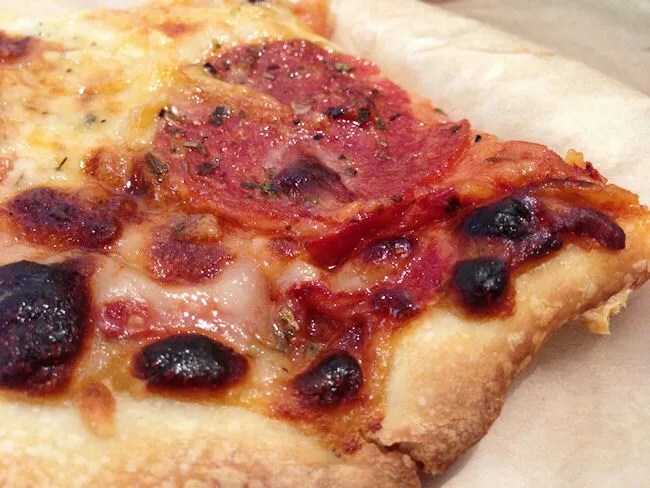 I’ve always been a fan of Auerlio’s whenever I have been lucky enough to eat at one and I was lucky enough this time for L not wanting to finish her pizza, so I got a little bit of her leftovers. Park Place Cafe is what it is. It’s a cafeteria inside a zoo. We’ve eaten at many places like this and they all work about the same. The food is nothing to write home about, but it’s good enough to satisfy you and get you back on your way. That’s what we were looking for when we walked in the door and that’s what we got.